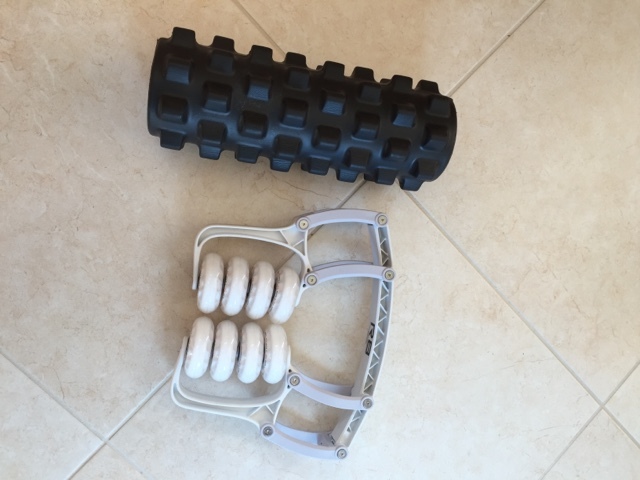 Recently I stumbled across the roll recovery onlinehttp://www.rollrecovery.com/R8/ It looked interesting but very expensive; could I really justify the price when I already have quite a few massage type things? I read a fair few reviews which were saying it was much better than the stick/foam roller and nearly as good as a real massage so I decided to give it a go. If it can reduce the need for massage then it would pay for itself quite quickly. I've been using it for a few weeks and am so glad I bought it; the reviews were correct, it is much better than my rumble roller and marathon stick. My main problem with the rumble roller is that you have to get on a hard floor to use it as it puts dents in the carpet! 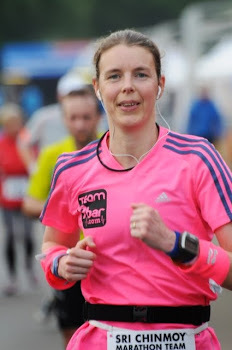 When tired after a run getting onto the floor is not that appealing and then trying to balance makes it all too much like hard work meaning it doesn't happen as much as it should. ( I have tried a normal foam roller which I find is not much use compared to the rumble roller). The massage stick is quite good post hard run but doesn't get very deep. The roll recovery is the best of both.... 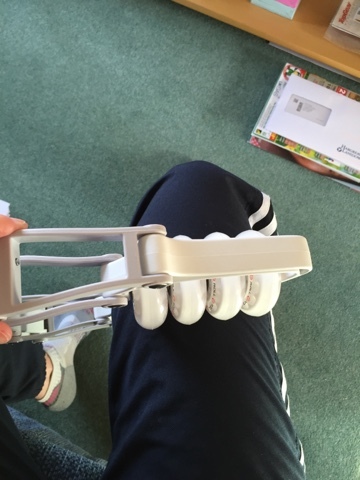 It gets deep like the rumble roller yet you can do it sitting on the sofa (or standing up to get to some parts) like the massage stick. You can get to areas the rumble roller can't get eg inner thighs. 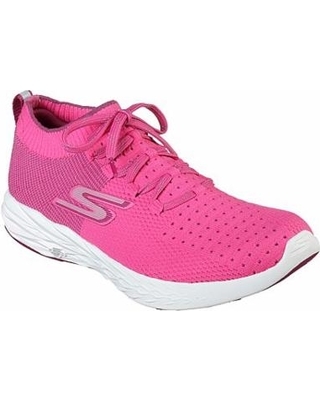 The only downside is that it is heavier than both (jut over 1km) so I won't be taking it on holiday as I struggle to keep below 20kg! 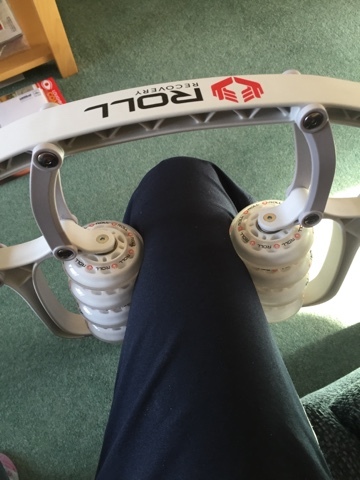 The roll recovery has rollers on both sides so whilst you are massaging your IT band your inner thigh also gets a massage. If you want less pressure you can pull the roller apart a bit, more and you add pressure. So you can ease off on your inner thigh and put more pressure on your IT band if desired. 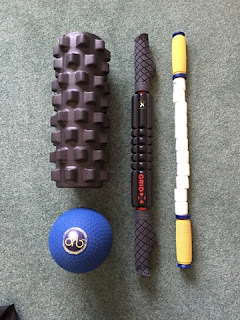 An area which is tricky with the foam roller is the hamstrings. With the roll recovery the hamstrings are done at the same time as the quads. If you find a tight spot/ trigger point you can stop to work on that bit putting more pressure on and kind of wiggling it around much like you would with the rumble roller. Calves are a bit tricky as you don't want the roller to go over the shin bone although I read you could put a towel over the shin. However, you can still get a good massage by working the sides and nearly round the back of the calf so you don't miss too much. I found a couple of very tight spots at the top of my calf which my other toys hadn't picked up so have been working on those but it hurts quite a lot so I can only do a few minutes. It is possible to get at the hip flexors and glutes but it doesn't get into the glutes particularly well - still use my blue ball for glute. When I started using this it hurt a lot (in a good way) but that is probably because I was quite tight from lack of massage and rolling. 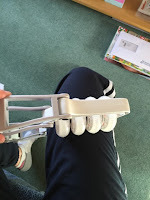 Now I have been using it for a few weeks the pain is less but that is not to say I can't feel anything; I still feel plenty of tight spots which need work. In conclusion; this is defiantly worth getting. 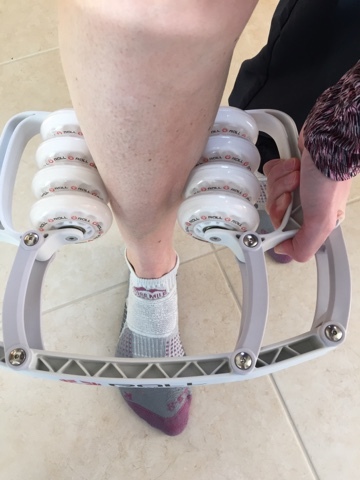 It is better than a rumble roller in that you can get to places the rumble roller doesn't reach; it is easier as you don't have to roll around on the floor I do feel I get a better massage than with the rumble roller. However, I don't think anything will replace a proper massage. Using this will likely reduce the frequency of proper massage and as you can do it at home 10 minutes a day helps keep on top of tight spots before they get too bad. The downside is that it is not as easy to put in your kit bag as the stick and is quite heavy if travelling with a tight luggage allowance - no problem if going in the car to races though.